I baked these biscuits as a contributing post for gourmet, unbound, which is a "collaborative monthly cooking celebration" in honor of the now defunct Gourmet Magazine. Each month, contributors pick a recipe from an issue of Gourmet of the corresponding month. This biscuit recipe is from February 1999. I usually make biscuits with either buttermilk or yogurt. These call for cream, which I thought sounded luxurious. I found them to be very subtle. They reminded me of a good pie crust or shortbread cookie. I rolled mine a little too thin, so they were a bit drier than they probably would be if they had been thicker. They would make a great base for a real strawberry shortcake. -My kitchen is in the midst of a renovation, so I needed something easy, which biscuits are. -I think too many people are intimidated by biscuits- hence the success of canned or frozen biscuits. I want to show that they really are easy and not much more time consuming than canned/frozen. 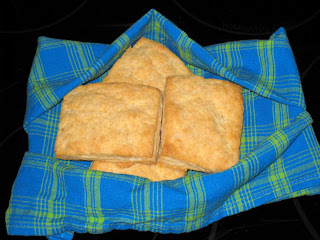 -When presented with several recipes to chose from, the Texan said, "You know I like biscuits." -And I really like biscuits, so how many more reasons could I possibly need? Not only are biscuits easy. You probably have all the ingredients in your kitchen right now. -I believe that the fewer ingredients a recipe calls for, the more important the quality of the ingredients. There are only 5 ingredients in this recipe, so make them count. 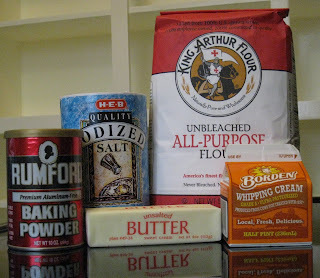 -Flour- I started using King Arthur Flour (KAF) years ago because it was the only unbleached flour that I could find in my grocery store. That is no longer the case, but I stick with it because it has always given good results. Feel free to use any brand, including generic, just make sure that it is unbleached. It will taste better, and do you really want to eat bleach anyway? -Baking Powder- I use Rumford because it doesn't have aluminum in it, another substance I would rather not eat. -Salt- Use any fine salt; coarse salt won't work well because there isn't enough liquid in this recipe to dissolve the larger crystals. -Butter- Unsalted, so that you can control the amount of salt that is added. And make sure to use real butter. Butter really is better, yum. Make sure it is cold, don't take it out of the fridge until you are ready to use it. -Heavy cream- In a recipe like this I don't really notice any difference between the different types of cream, like heavy cream or whipping cream. 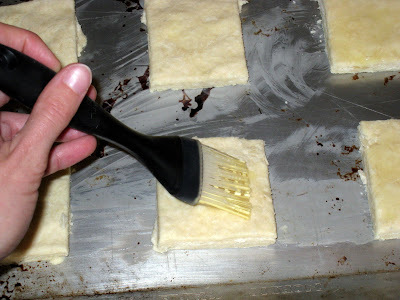 A pastry cutter is the only special equipment that will come in handy, though you can certainly make do without. 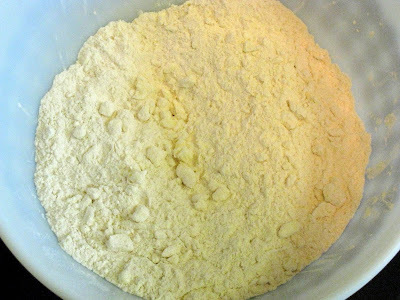 -Mix the flour, baking powder and salt together in a large bowl. The recipe says to sift, but I don't. Just make sure that the baking powder and salt are well distributed in the flour. 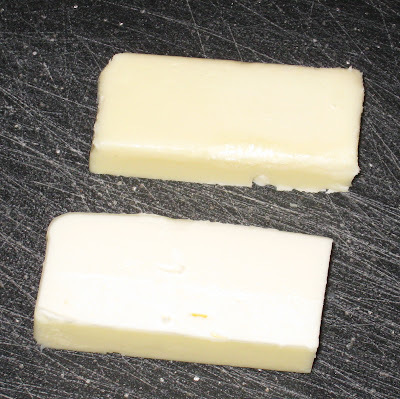 -Cut the butter into small pieces. I first cut the stick in half longways. Then cut those pieces in half longways. 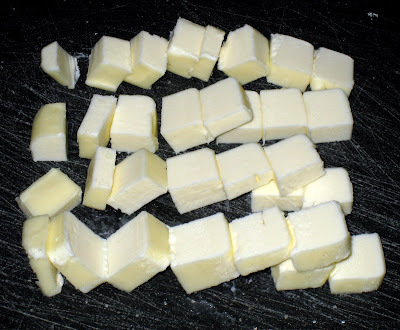 Then cut these mini butter sticks into little pieces. - Add the butter to the dry ingredients. 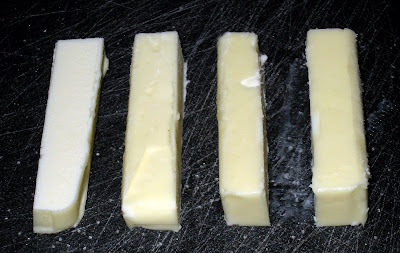 Using the pastry cutter, cut the butter into the dry ingredients. 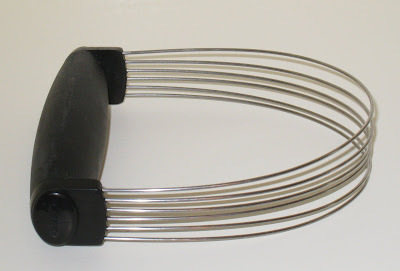 If you haven't used a pastry cutter before, think of it like a potato masher. If you don't have a pastry cutter, you can just use your (clean) fingers to smoosh the butter into the flour. Some cookbooks also recommend using the tines of a fork, or two knives, though I have never had success with the knife method. Work the butter in until it resembles coarse meal with a few pea-sized chunks. -Add the cream, stirring with a fork just until combined. It will be dry, chunky and flaky. That is OK. Flip this out onto your cutting board. -The original recipe says to knead this into a cohesive dough, but I think knead is too strong of a word. This isn't yeast dough, where you are trying to develop the gluten. 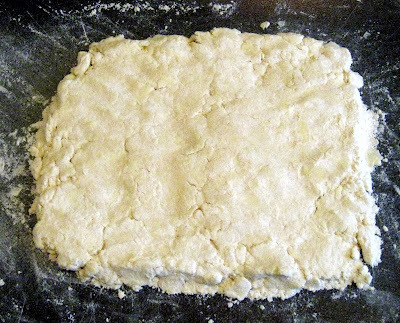 You just want this dough to hold together. So use the heel of your palm to press this out. A slight smearing motion will help it hold together. The recipe says to knead 3 times, but basically you are trying to fold it three times. So press it into a rectangle, then fold in half. Repeat twice. After the last fold, press out to 1/2 inch. I pressed mine too thin, as seen in the following picture. Note to self, if in doubt, get a ruler. 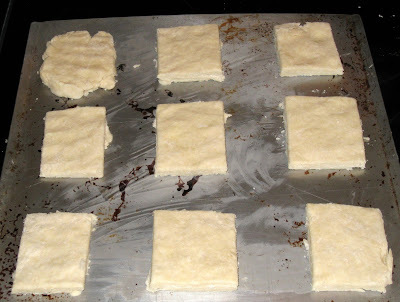 -I am lazy efficient, so I make square biscuits. Sure, round are traditional, but they leave lots of scraps that need to be rerolled, etc. Also I have no idea where my biscuit cutters are right now. When you are cutting biscuits, whether using a knife, like I did, or a biscuit/cookie cutter, you want to press straight down. Don't twist or saw. I haven't ever done a true experiment with control groups, etc, to test this, but supposedly twisting the cutter will decrease the ability of the biscuit to rise. And you want nice fluffy biscuits, right? Because I was trying to be a cool food blogger, I trimmed the edges, to get somewhat clean cut biscuits. If no one was looking, I would have just left the rough edges. See that biscuit in the top left corner? That is the one that I made by squishing the left-over edge pieces together. It also ended up being the thickest biscuit of the batch and therefore the best. 8-Brush tops with melted butter. See that really neat pastry brush I'm using? My mom gave that to me for Christmas. It is made of silicone, so I can use it on hot things, (I melted my last pastry brush, it wasn't silicone.) and it is really easy to clean. -Bake in a 425 degree oven for about 20 minutes, until pale golden. 10-Now scramble some eggs and cut up a grapefruit and you have a yummy breakfast. OK, you don't have to do that part, but that is what I did. I know that seemed like a long and complicated recipe. But you can have biscuits ready for the oven in the time it takes for the oven to preheat. Mix together flour, baking powder and salt in large bowl. 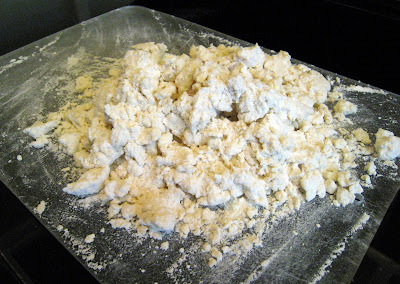 Cut 5 tablespoons butter in pieces and blend into flour mixture until it resembles coarse meal. Stir in cream with a fork. Transfer mixture to a lightly floured surface (I didn't really need the extra flour), smoosh together dough and then fold in half and flatten 3 times. 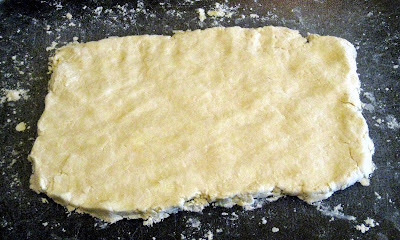 Pat dough into a 1/2 inch thick rectangle. 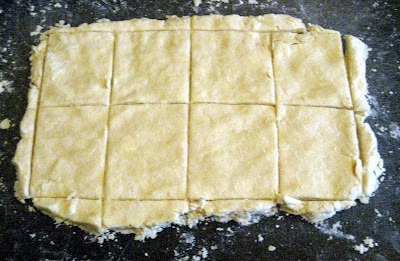 Cut into 6 or 8 smaller rectangles and transfer to baking sheet. Melt remaining tablespoon of butter and brush onto tops of biscuits. Bake in middle of oven until pale golden and cooked through, about 20 minutes. Your photography is great; ¿is the camera on a tri-, monopod? re knife method - small, round-point spatulas work better than most knives: too pointy! 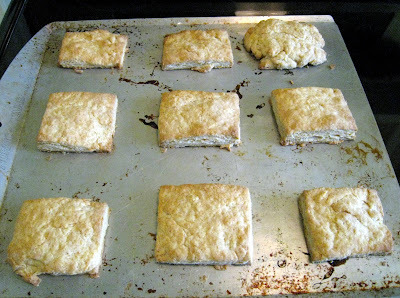 re spacing - the biscuits will puff up a bit more if they barely touch each other. John- No tripod, I'm just holding the camera. And trying not to get too much flour or butter on it. That is the best I've ever seen a recipe presented. I need pictures. Bluenose- Glad you liked it!